Would you believe when I was younger, disliked fries? But when I liked them, it was a never ending love affair. When I was pregnant with both kids, I used to have one pack so often just to satisfy my craving. I would ask our cook at home to make me some homemade fries. This love affair was passed on to my kids as well. I know it's not the healthiest, but french fries are really yummy. Hahaha!! I know, unhealthy! When I saw Pompoms on my IG feed, I knew I had to try it. But since it's located in Robinson's Place Manila, well - that was the biggest hurdle. I rarely find myself going there. I honestly have forgotten the last time I was there. It used to be a place my college friends and I frequented while in college. But then, I was told that it has become bigger - more areas were added. So when Rowena and I found ourselves in Robinson's Place for an event, I made sure to let Ro know that I wanted to try Pompoms. I was honestly wondering where it was. But like a stroke of luck, we walked passed it and told ourselves that we'd try it before heading home. And try it we did. Above is their fries. It's did not come from a pack. Instead, it's made fresh from locally sourced potatoes. It's cut (they have cutter, then boiled, then fried, then frozen and when you order, they fry it a second time. It's a quite tedious process but I understand why. The boiling/steaming makes the potatoes soft. Freezing it after frying it first makes it crispy in the outside and soft in the inside. They fry it a second time to make sure it's fresh hot and crispy upon service. We ordered Ketchup powdered fries with mayonnaise on the side. 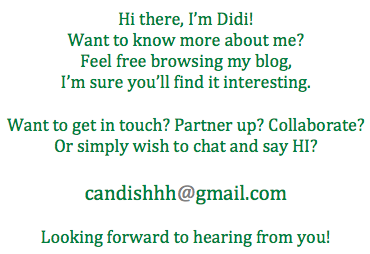 To be honest, I was skeptical. 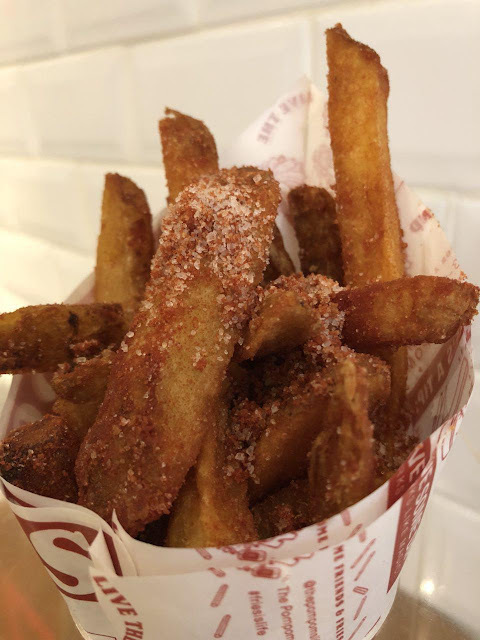 I am not one who puts ketchup on their fries, I want mine plain salted. But I was willing to try it because Rowena was with me. Hahaha! And then we ordered the Chicken Skin Poutine (pictured below). Can you see the generous ketchup powder? Well, it was really good - it tasted like Pik-Nik, a real fresh Pik-Nik Ketchup Fries! I was blown away, it was really good. I couldn't stop myself from eating more and more. This I have to say it what I liked best. 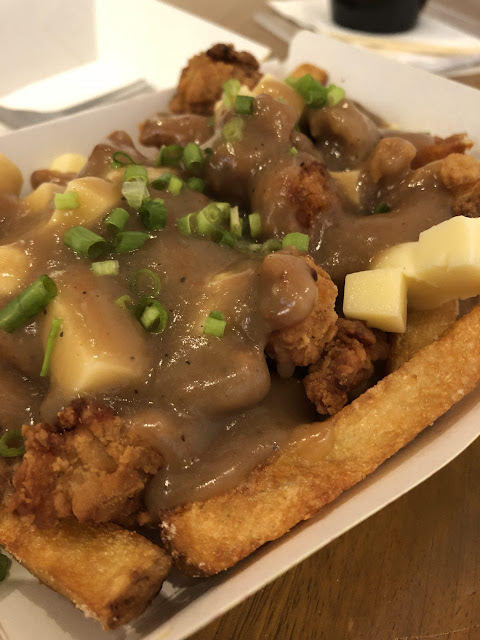 Above is the Chicken Skin Poutine, it was just okay. I think I was enjoying the Ketchup fries very much that this tasted just ordinary to me. But in fairness, the chicken pieces were good! 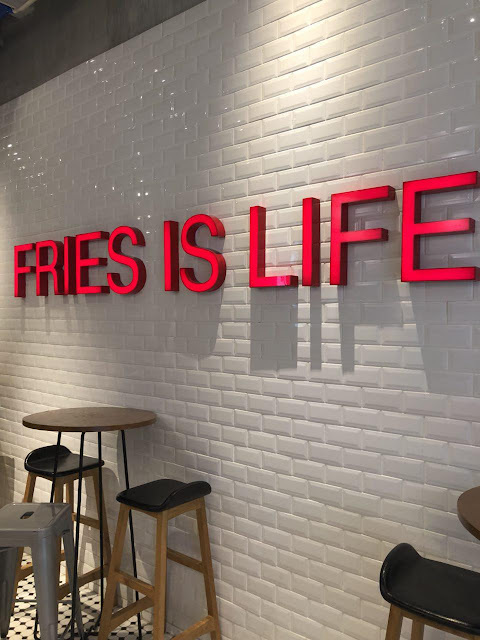 Truly, FRIES IS LIFE! I know I'd survive with just eating fries all the time. I know, it's not healthy. Hahaha!! 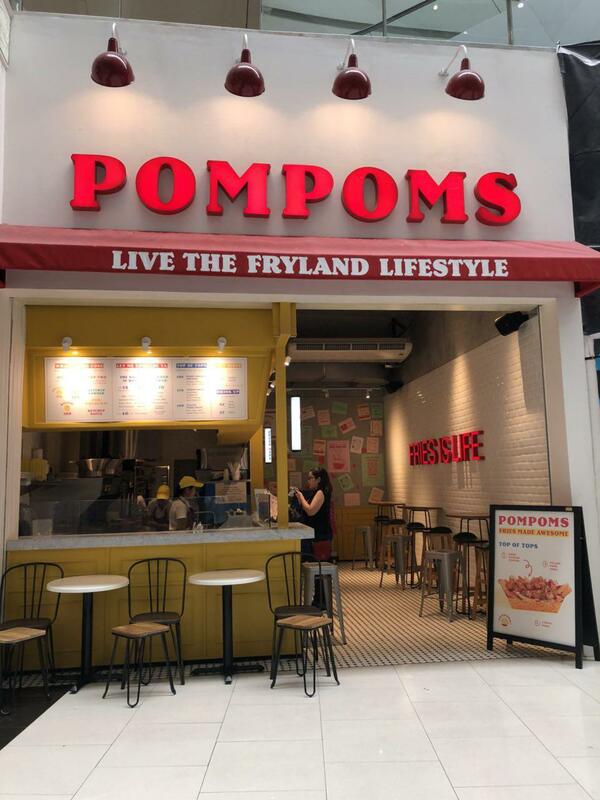 Pompoms is located at the ground level of Robinson's Place Manila.